Chinese New Year is just around the corner, with the festivity spirit Maybank has come up with a Facebook application designed specially for everyone to customize and send some really innovative e-cards. So if you have yet to send out a physical card, why not take this opportunity to wish all your friends via e-cards this Chinese New Year! The mechanics to send Maybank's Chinese New Year e-card and join their contest is rather simple actually. 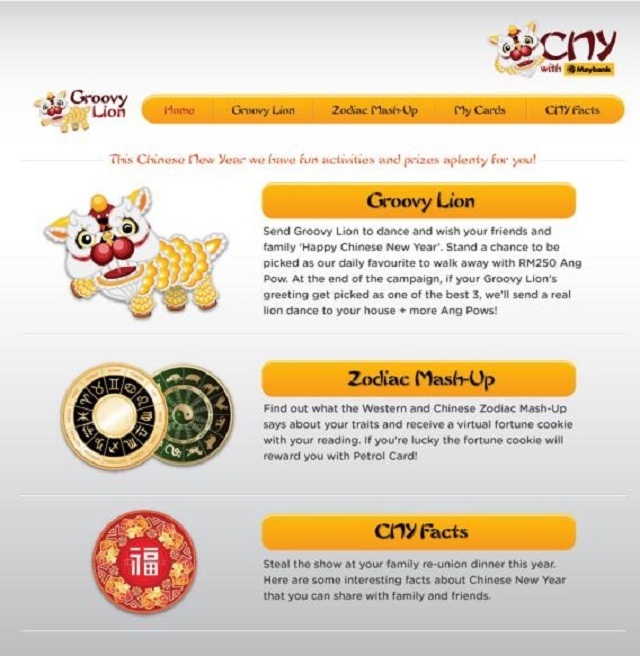 All you have to do is to go over to their Facebook Page at this link, pick one out of three types of background musics and customize your very own lion dance’s movement that will be played when the receiver opens the e-card. Now I found the Groovy Lion e-card really unique. We get to customize the lion's movement in addition to adding some music and personalizing the message that appears. Just drag and drop the animation and music in to send! It's kind of cute in it's own way. Check out what I have done which I have sent to my friends on Facebook. Click, Drag, Drop and Send! 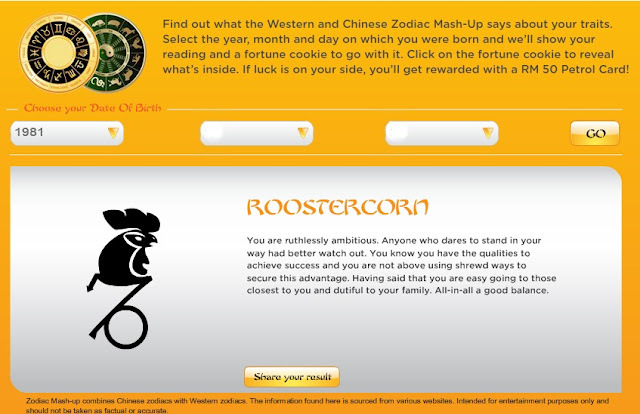 After sending that cute e-card, I even took the chance to check out my virtual fortune cookie via Maybank's Zodiac Mash-Up application. Check the readings below. "You are ruthlessly ambitious. Anyone who dares to stand in your way had better watch out. You know you have the qualities to achieve success and you are not above using shrewd ways to secures this advantage. Having said that you are easy going to those closest to you and dutiful to your family. All-in-all a good balance"
Now after reading my fortune cookie. it doesn't really sound like me at all, but probably the new year may just bring out this change in me. 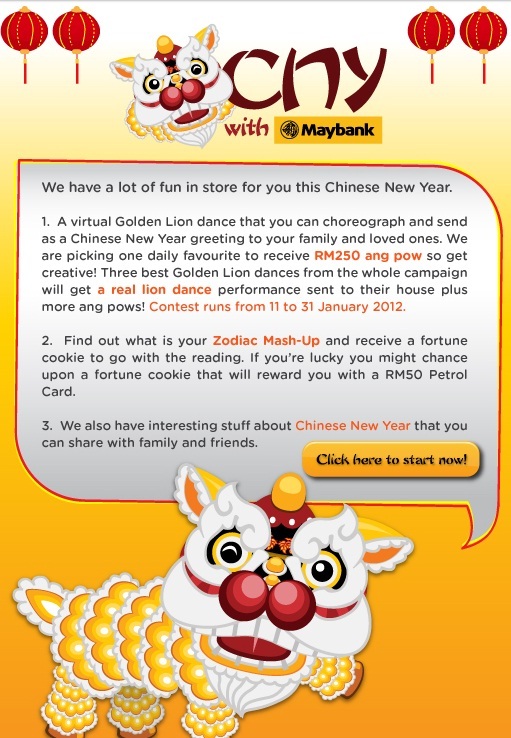 Do check out Maybank's Chinese New Year Facebook App to find out more! 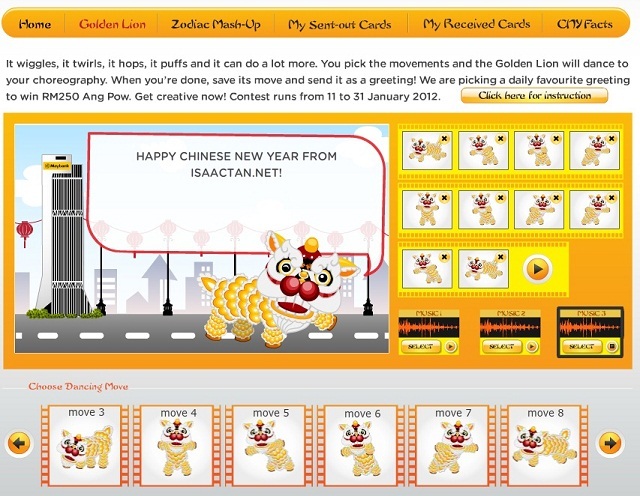 There will be a daily winner of RM250 Ang Pao for the most creative e-card created, so do check them out soon. I am so lazy to look at the whole mechanics! Luckily you simplified it.